PM attends Rosh Hashannah toasts with various security organizations, including IDF General Staff and Shin Bet. 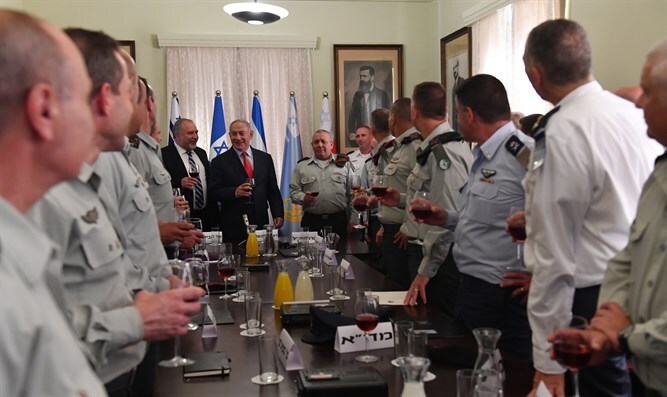 Prime Minister Binyamin Netanyahu today attended toasts for the Jewish New Year with the state's various security arms: the IDF General Staff Forum, the Internal Security Agency (ISA, or Shin Bet), Atomic Energy Commission and the National Cyber Directorate. The Prime Minister briefed them on the 2030 security concept. "The prime minister told the ISA personnel: "The ISA deters, thwarts and defeats on a daily and hourly basis those who seek our lives. Not a day goes by in which there is no preventive action. And if the State of Israel stands apart from the shocks roiling our region and from what is occurring in the countries around us, and it stands very much apart, it is not because there are no attacks or attempted attacks. It is because there is defense, counter-action and deterrence. Your part in this is considerable." "Would that I could detail to the citizens of Israel on a daily basis the reports that I receive or the operations that I approve. It is easy for me to approve them because I rely on you. I see what you do. Now we must prepare for the future," he told the members of the intelligence agency. Prime Minister Netanyahu, Defense Minister Avigdor Liberman and IDF Chief-of-Staff Lt.-Gen. Gadi Eisenkot then toasted the New Year with the IDF General Staff Forum and toured the historic and newly renovated Prime Minister's Residence at the Defense Ministry complex in Tel Aviv. Prime Minister Netanyahu participated in the ceremony to affix a mezuzah. Netanyahu told the IDF General Staff Forum: "I commend the renovation of this amazing room [the discussion room at the Prime Minister's Residence in Tel Aviv]. The renovations are wonderful. This is an historic place. This is an important moment in the history of our people." "I want to wish the General Staff Forum a Happy New Year. I believe in you. I am proud of the IDF and our ability to meet all of the challenges with great success on behalf of the security of Israel. Happy New Year."